Jaway steel is major manufacturing specialized in stainless steel wih high quality and best price! Which can be widely used in bicycle fittings, kitchen and sanitation tools, goods shelf, pet cages, gill racks, decorative handles and baskets, food and medical machinery accesses, etc. The surface of the stainless steel plate is smooth and has high plasticity, toughness and mechanical strength, and is resistant to corrosion by acids, alkaline gases, solutions and other media. It is an alloy steel that is not easily rusted, but it is not absolutely rust-free. The stainless steel plate refers to a steel plate that is resistant to corrosion by weak media such as atmosphere, steam, and water, and the acid-resistant steel plate refers to a steel plate that is resistant to corrosion by chemical etching agents such as acid, alkali, and salt. Stainless steel plates have been around since the beginning of the 20th century and have a history of more than a century. Regular size is 4FT×8FT. The total heat transfer coefficient of the metal depends on other factors, in addition to the thermal conductivity of the metal. In most cases, the film's heat dissipation coefficient, scale and metal surface condition. Stainless steel keeps the surface clean and tidy, so its heat transfer is better than other metals with higher thermal conductivity. Liaocheng Suntory Stainless Steel provides technical standards for stainless steel plates. High-strength stainless steel plates with excellent corrosion resistance, bending processability and weld site toughness, and excellent stamping performance of welded parts. Specifically, it contains C: 0.02% or less, N: 0.02% or less, Cr: 11% or more and less than 17%, and an appropriate content of Si, Mn, P, S, Al, Ni, and satisfies 12 ≤ Cr Mo 1.5Si ≤ 17, 1 ≤ Ni 30 (CN) 0.5 (Mn Cu) ≤ 4, Cr 0.5 (Ni Cu) 3.3Mo ≥ 16.0, 0.006 ≤ CN ≤ 0.030 stainless steel plate is heated to 850 ~ 1250 ° C, and then carried out at 1 ° C / s The above heat treatment for cooling rate cooling. Thus, it can be a structure containing a martensite having a volume fraction of 12% or more, a high strength of 730 MPa or more, corrosion resistance, bending workability, and a high-strength stainless steel sheet excellent in weld heat-affected zone toughness. By using Mo, B, etc., the press working property of the welded portion can be remarkably improved. The flame of oxygen plus gas cannot cut stainless steel because the stainless steel is not easily oxidized. Mainly used in high temperature applications, high temperature applications require strong sensitization of materials to prevent intergranular corrosion at lower temperatures. 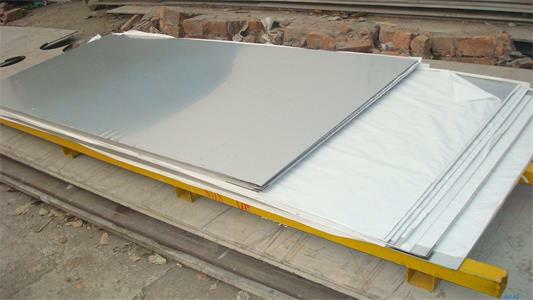 Stainless steel plates have high temperature oxidation resistance, but the oxidation rate is affected by inherent factors such as the exposed environment and product morphology. If you want to get more information about 4FT×8FT stainless steel sheet, pls contact us-Jaway Steel-via 819@jawaysteel.com!